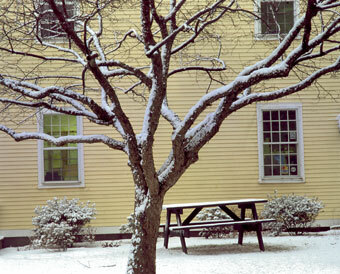 Picnic table left behind in the snow outside an historic house in Glastonbury, CT. A checkerboard of window panes contrast with the horizontal striped clapboards and vertical tree branches, leaving the table occupying compositional middle ground. With snow arriving early this year, it’s doubtful the table will be hosting any more hungry visitors with their ziplocked sandwiches and store-bought bags of potato chips. I pass this Main Street site at least twice a week, and I’ll see if town workers make another pass to collect the table for winter storage.